Folks in Mississippi must have really bad feet. A reader in Texas was puzzled about my reference to my “walk fit” shoe inserts, which are making it possible for me to compete in my first half marathon. I purchased them from an infomercial which runs every 25 minutes on some station in my market area. I can’t believe they’re not peddling them to Texans – who must also have club feet after wearing those constrictive cowboy boots all their lives. My handicap was self inflicted – I insisted on wearing spike heels for more than 40 years during my last life as a banker. I never should have worn those shoes, and I never, never should have been a banker. I was like a square peg trying to fit into a square hole. 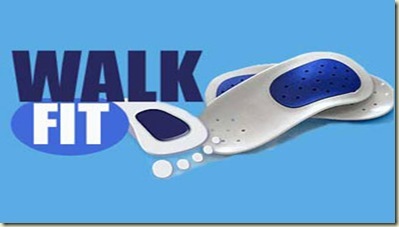 About Walk fit orthotics: I saw an orthopedic surgeon several years ago about foot pain. He prescribed some prescription orthodics which would only fit into my athletic shoes and set me back almost $400. No joke. They helped, but one day I saw the infomercial about “walk fit” which retail for less than $20. I figured it wouldn’t hurt to give them a try even though every other item I’ve ordered from an infomercial has shown up two weeks later in Walmart – for half the price hawked on TV. I was a happy customer and I’ve have now retired the expense inserts in favor of Walk Fit. I was a little show in warming up to them since it feels like you have a triple wad of bubble gum under your arch at first. But after a couple of days, when I figured out which insert was right for me, it made a world of difference. Walk Fit claims its insoles reduce pain in feet, knees, hips, and back. Each pair of walk fit insoles comes with 3 customizable arch inserts – low, medium, and high. 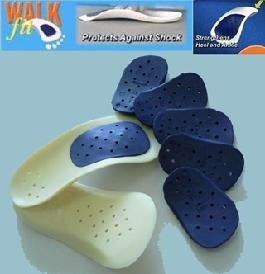 Once your feet have adjusted to the walkfit orthotics you will experence a noticable increase in foot support and comfort, they claim. This entry was posted in Coping with retirement and tagged Running marathon with Walk Fit Orthodics, Walk Fit Orthodics deliver by Emily Jones. Bookmark the permalink. Those of us with celiac genes or disease tend to have very little cushioning under our feet and hands, and my sister wears, or at least did, something like a size 9 AAAAA shoe. Yep, that’s five A’s for those who thought that was a typeO. My mother has feet exactly like hers — AAAAA’s. Now about those cowboy boots, would you believe it — I had some as a child that my mother simply could not hide for YEARS after they were too short. Think she was saving them for any possible new sibling (the one who just called, for instance). Anyway, guess I was in my “chimp” stage of development, cause no matter how high up she hid those things, she’d find me wearing them later. I even managed to find them in the garbage can when she’d finally given up on keeping them off of my poor feet. As a result, both my big toes are crooked. These boots, by the way, were worn to every performance of Roy and Dale (while I had them) down at the old Houston Coloseum downtown on Buffalo Bayou, when, for years, they’d perform at the Houston Fat Stock Show and Rodeo, as we called it then. Now, to be politically correct, it’s referred to as the Houston Livestock Show and Rodeo. It is the largest rodeo in the world, and the championships in rodeo are held there annually. Once Roy and Dale left, we started just going to the Live Stock Show — so many beautiful animals and neat young people attending their animals. This event is coming up soon, by the way. It started in February for decades, but now, gets started first part of March. It runs for weeks every year. We especially enjoyed petting Trigger and Buttermilk between performances, out in the livestock areas. Can you imagine getting that close nowadays??!! Not! If that wasn’t bad enough, I took two very long hikes through the Grand Canyon as an adult, and the last, longer one must’ve collapsed my arches a bit. Somewhere along the way, I got something like Morton’s Neuroma with a painful, snapping sensation from between a couple of toes and running quickly down the bottom of my feet. Had this for years! This would be especially painful if I wore heals, and sometimes even a new pair of tennie runners would result in that after wearing them a while. To my utter shock, this went away completely as did most of the tendon, ligament, muscle tightness, bone pain, etc., in my body as a result of getting off gluten, so it must’ve been the severe immune reactions I was having that were causing those as well. By the way, I had just been diagnosed with arthritis in my feet with lots of morning swelling right about the time I started on that diet, and that went away in three days of dieting when I had no idea tiny amounts of the stuff were “hidden” in so many processed foods these days. They use it to make food enhancers to put taste back into over processed foods since processing reduces the natural taste of the food. I think many food enhancers are also made out of soy (I react to soy as well). It’s a good thing that I recognized the relationship before I’d removed the tiny amounts or I might not have stayed on the diet long enough to calm the GI issues — that took longer, particular since there were other foods I didn’t know were also a problem. Anyway, I no longer have foot pain, and no longer wear heals, but I have not had any of the abnormal pain since Thanksgiving of 2003, thanks to the removal of gluten. Unfortunately, the toes are forever crocked! I did, however, meet a lady at the meet counter who, after hearing me mention what my meat had to be free of to the butcher, volunteered that she couldn’t have soy because it made her feet swell, so it’s not just gluten that can cause this, apparently. Everyone is different, and some people apparently don’t have recognizable symptoms which is scarey, due to the long term consequences. Anyway, I’m going to see if I can get my sister to order a pair of those. Sure would save her lots of money on orthotics! She has to stand on her feet all day long seeing patients, and then helping me take care of our mother who has Parkinsons. I wanted some cowboy boots so bad, but my parents would only buy me some of those faux “chaps” (I think they were called). Hope walkfit helps Kay – No, never heard of a AAAAA! Sounds like the width of my index finger!